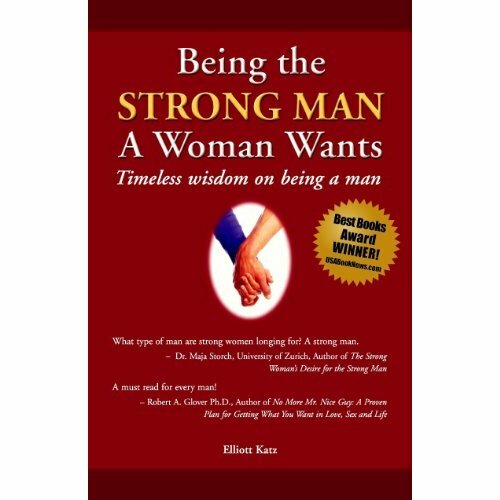 Elliott Katz is the author of Being the Strong Man a Woman Wants: Timeless Wisdom on Being a Man. After the end of his relationship, Elliott went on a journey seeking the wisdom on how to be a man. He was amazed by the insights he found along the way, and shares them in his book. Originally, the book was meant for himself a few of his close friends. Then, Elliott realized the book represented something that any man could benefit from. If you are a guy who has experienced the feeling of being disrespected by the women in your relationships, perhaps you’re not acting like the man she needs you to be. We ask Elliott to explain more about what he learned, and how any guy can reclaim his leadership, decisiveness, and inner strength. There is no special diet or weightlifting involved; it all begins with the mental decision to act like a man. Adultdatingsites: In dating situations, What is the biggest complaint you hear from women? Elliott Katz (EK): A man asks a woman out and expects her to plan where they’re going. I couldn’t count the number of single women who say how fed up they are when a man asks them out for a cup of coffee and then won’t plan where to go — he wants her to decide. And when they finally get to a place, he won’t choose a table — he wants her to choose. A woman wants a man with a plan. Women feel more positive about men who take the time and plan a date that both people would enjoy. Adultdatingsites: What are the signs that a guy is lacking respect from the women he is dating? EK: If she puts you down in a joking way in front of other people, she does not respect you. You have not shown her you are worthy of respect. Look at yourself and how you need to changeand grow so she will respect you. Adultdatingsites: What do you think is the percentage of men who are not taking their role as a man, seriously, and are paying for it with a loss to their relationships? EK: Women today complain that men don’t act like they expect a man to act. It’s not that men aren’t taking their role seriously. It’s that most men today were not taught the insights about being a man that fathers and other older male role models used to teach younger men. As a result, men today are bewildered by the messages they’ve heard. Many think they’re showing women that they’re non-controlling sensitive guys when they leave making decisions to women. They can’t understand why women don’t appreciate them. When I tell men that women want men to be strong and show leadership, many men say they’ve never been told this before. Adultdatingsites: Do you have an idea of where this sensitive thing got started in the first place? EK: Many men today grew up without strong male role models. When they heard ideas in the media that men should be sensitive and develop their feminine side, they went along because they didn’t have the foundation of a strong male role model who taught them what it means to be a man. Adultdatingsites: Are the nice guys losing out the most, or are the traditional macho types hurting too? EK: Women don’t want a weak nice guy or a self-centered macho type. They want a strong man who shows leadership, makes decisions, takes responsibility and is considerate of the woman’s feeling. Nice guys seem to be losing more as macho types appear to be strong. Adultdatingsites: Do women want a man to have any sensitivity? Where is the line that he should draw? EK: The word sensitivity has several meanings. Women want a man who cares about and is aware of and sensitive to her feelings. But the sensitivity where men are always pouring out their emotions is a big turn-off to women. Adultdatingsites: When guys hear this, a lot might think that it is okay to do a lot of other traditionally macho (bad boy) things… What are some iconic masculine habits that are really not manly? EK: Macho and being manly are opposites. Being macho is being showy, self-centered, controlling and thinking only about yourself. Being manly is the positive qualities of being a man — being mature, independent and decisive, having integrity, high moral qualities and self-discipline, and having the courage to deal with difficult situations and not back away despite your fear. Adultdatingsites: How can a man find his inner he-man? Are there a set of exercises that may help rebuild his confidence? EK: People often choose friends who are like themselves. Watch men who are strong and take charge. Watch how their women admire them. Make friends with them and work on becoming like them. Men need to be around other men to recharge their masculine batteries. Remember the woman in your life wants you to be a strong man. Adultdatingsites: As a guy gets ready for a date, what should he tell himself repeatedly in order to help put him in the right state of mind? EK: Put a lot of the new ideas about dating out of your mind. They don’t work and turn women off. Adopt the ideas that work, such as: When you ask a woman out, be a man with a plan. Take the time to plan activities that you think you would both enjoy. She won’t think you’re controlling; she’ll think you’re a man who can take charge and cares enough about her to make the effort to plan the date. Pick her up. Open the car door for her. She won’t think that you think she can’t open the door for herself. She’ll feel that you care about her. When you go out, pay for her. Expecting a woman to split the bill with you is not the way to show you believe in equality of the sexes. When you pay for her, it makes her feel special. Nobody wants to date someone who is a taker — there are other ways she can show you she is a giving person. Adultdatingsites: Any other final comments that you would like to share? EK: Many women today say they are single because they can’t find men who are strong and take charge. They do not want a man who is oblivious to problems and waits for the woman to tell him what to do. Today’s men need to be stronger and show more leadership. This will make your girlfriend or wife happy. It will also give your son a role model of how to be a man and give your daughter an example of what a man should be.